I recently took the time to play with SQL requests and FurMark scores database. I extracted two lists: the 10 most popular graphics cards for the last 30 days and for the last 12 months. I also compared FurMark statistics to 3DMark2006 ones at YouGamers. 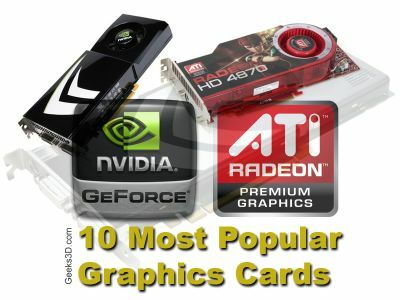 From all these statistics, the four most popular graphics cards are the NVIDIA GeForce GTX 260, ATI Radeon HD 4870, ATI Radeon HD 4850 and NVIDIA GeForce 8800 GT. What about ATI HD4770 ? what version of the GTX 260 is it, because there are two versions of it. hi guys can u guide me plzz tell me which card is Better of these two.. The 9600GT with 1GB RAM is definitely better. For having the forth most popular video card the graphics are fantasitic, Radeon 4850 not bad for a laptop. I have a Twintech Geforce 8800GT 512MB with 4 heatpipes. I get a score of 3170 omarks, and i don’t even have oc’ed it! I think that i will try that very soon….